Keith Duffy with Steven Gerrard, Brendan O’Caroll, Steve Spencer and Jay Duffy. Picture: Brian McEvoy. 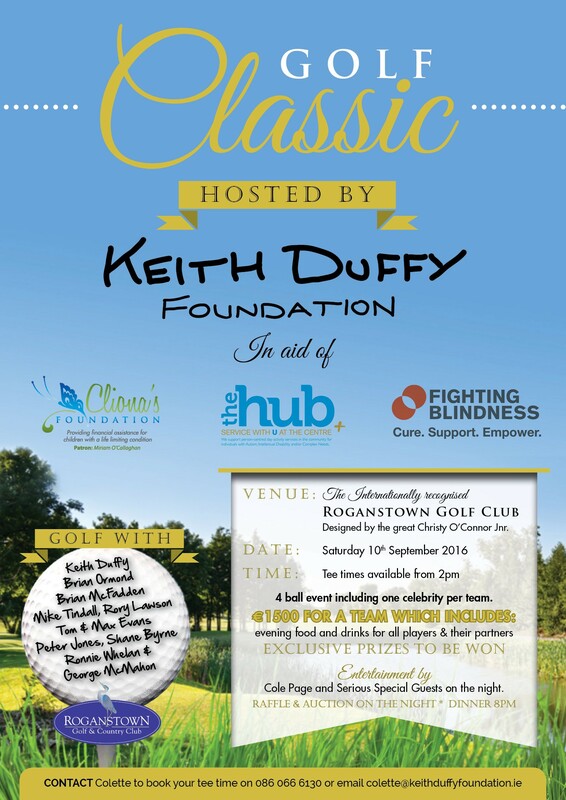 The Keith Duffy Foundation Annual Golf Classic is taking place on Saturday, September 10th 2016 at Roganstown Hotel & Country Club in Swords, Dublin. Many high profile names will be coming on the day to play golf and raise funds for this year’s chosen charities including Keith Duffy, Brian Ormond, Brian McFadden, Shane Byrne and George McMahon. The Keith Duffy Foundation was established in 2015, with the aim of providing support and financial assistance to the foundation’s chosen charities across the country. Keith has been using his experience and contacts, garnered through his 14 years as patron of Irish Autism Action to achieve the goals of the charity. The Golf Classic is a fundraiser in aid of the three charities close to Keith’s heart – Cliona’s Foundation, The Hub and Fighting Blindness. Fighting Blindness is an Irish patient-led charity funding and enabling world-leading research into treatments and cures for blindness. They provide a professional counselling service to support people and families affected by sight loss. The Hub support person-centered day activities services in the Dublin area for individuals with Autism, Intellectual Disability, and/or Complex Needs. “All three of these charities do invaluable work and offer much need services to the community and this event is a fantastic day out in their honour,” added Keith. On the day, tee times are available from 2pm and the 4-ball event includes one celebrity per team. The cost of a team is €1,500 and this includes an evening of food and drinks for all players and their partners, a 4-course meal, entertainment on the night by Cole Page and some incredible surprise special guests and a raffle and auction with exclusive prizes to be won. The Keith Duffy Foundation Annual Golf Classic is taking place on Saturday, September 10th 2016 at Roganstown Hotel & Country Club in Swords, Dublin. This is an event not to be missed and to book your tickets, contact Colette Charles at Colette@keithduffyfoundation.ie or call 086 066 6130.